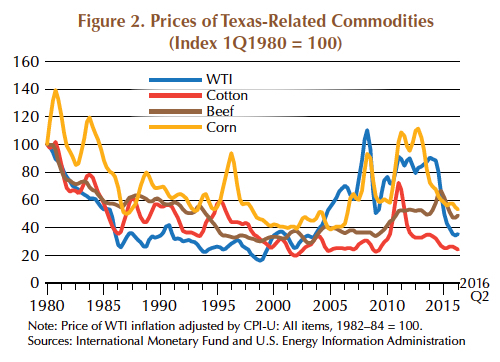 ​Three historic pillars of the Texas economy are all commodities­—oil, cattle, and cotton. The state's vast territory and natural resources have allowed it to thrive through the production of these commodities. The long history of commodity price booms and busts suggests volatility is inevitable. Commodity markets occasionally exhibit broadly based massive booms and busts. There have been three such episodes since the ​1950s. The first commodity cycle peaked in 1974, the second in 2008, and a third in 2014 (Figure 1). No simplistic explanation exists for what causes such episodes, but they do share similar characteristics. The growth of GDP and industrial production accelerated strongly in the periods just preceding or marking the beginning of the commodity booms. The end of the booms were characterized by substantial drops in commodity prices and coincided with a sharp weakening in GDP growth, demand, and industrial production (Figure 1). Not all periods of sharply accelerating economic performance give rise to booming prices in commodity markets; in other words, not all commodity booms are triggered by "demand shocks." Other preconditions have to prevail, such as tight production capacity and relatively small inventories. Such preconditions typically emerge after prolonged periods of weak commodity prices have discouraged investment in capacity expansion and instilled a sense that supply is secure, and there is limited need for holding inventory. Commodities are placed into various categories, depending on their physical characteristics and end use. These categories are energy (for example, crude oil and natural gas), cereal grains (corn, wheat, and rice), vegetable oils (soybean and palm), softs (sugar, coffee, cocoa, and cotton), precious metals (gold and silver), industrial metals (aluminum and copper), and livestock (hogs and cattle). Prices across all categories have tended to move in the same direction in the last decade because of the dominant role of global demand as a key common driver of price changes (Figure 2). For example, oil, cotton, and corn saw a sizable decline late in 2008 following the turmoil in world financial markets. They have also shown pronounced comovement in response to financial shocks (Figure 2). Prices for some commodities such as food are less sensitive to changes in global demand, forcing a distinction to be made across producing regions. Oil is currently the state's stellar commodity. It is a major source of income and employment through its upstream and downstream sectors and its relationship to other industries such as manufacturing (Figure 3). Corn is another important Texas commodity. 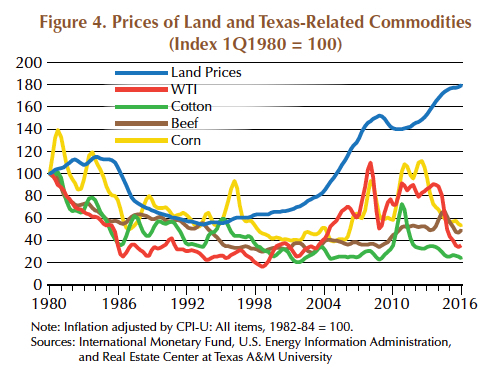 Commodities have a direct and indirect effect on Texas land prices. The state's size and variable land characteristics have made it possible to produce commodities efficiently. 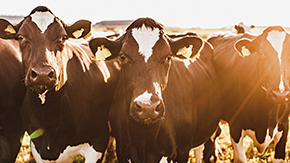 When agriculture and production of hydrocarbons account for a sizeable portion of land use, prices for their production can have a substantial effect on land prices. A surge in commodity prices has been associated with an acceleration in land price increases (Figure 4). Demand for recreational land is also affected by commodity prices as higher incomes allow for increased land purchases. 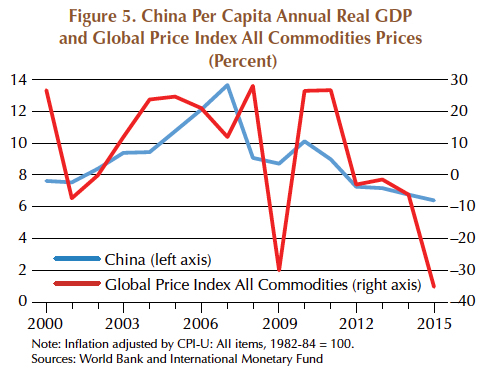 Rising commodity prices were a characteristic of the global economic expansion from 2003 to 2008. At the same time, Texas land prices increased by 98 percent in real terms from first quarter 2003 to first quarter 2009. When the global financial crises erupted and the Great Recession set in, prices crashed and the end of the commodity boom seemed imminent. 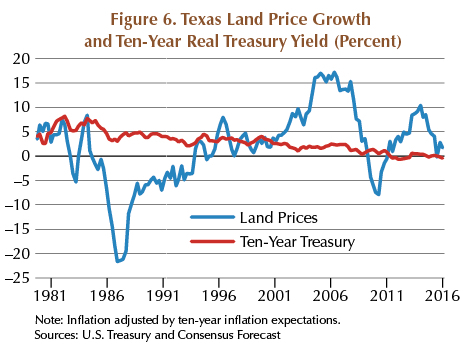 Texas land prices fell 8.1 percent in real terms from 1Q2009 to 3Q2010 (Figure 4). The global financial crisis, the Great Recession, or the ensuing bumpy recovery did not stop the commodity boom. Higher growth in emerging and developing economies such as China and supply constraints sustained the boom (Figure 5). Prices rebounded in the early stage of the recovery, and by the end of 2010, prices of many commodities were close to or above precrisis peaks (Figure 5). However, land prices lagged the recovery in commodity prices, increasing by 9.9 percent in real terms by 2Q2013 from 3Q2010, recovering the losses registered as a consequence of the Great Recession (Figure 4). The commodity boom halted in late 2014, and a bust period began as the effects of the stimulative policies implemented in emerging markets and developing countries, particularly in China, started to fade. As prices started to fall as the result of weaker global economic growth. In contrast, Texas land prices continued to register positive price growth, increasing by 17.1 percent in real terms from 2Q2013 to 2Q2016 (Figure 4). However, the land price growth rate declined in the wake of the commodity bust at the end of 2014. 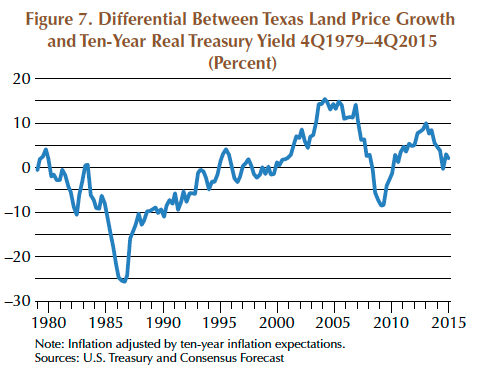 A divergence between commodity prices and land prices appeared after 4Q2014, in part because the Texas economy avoided a recession, and interest rates remained historically low (Figure 4). 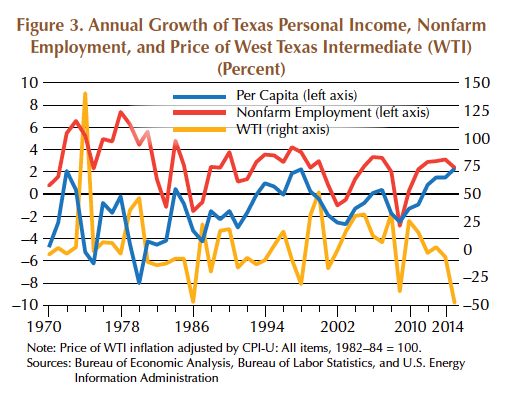 Compared with previous declines in commodity prices, particularly oil prices, the Texas economy did not experience a recession. A historical low-yield environment made purchasing land an attractive investment compared with the expected return on other assets. Expectations determine the value of land as well as other investments. However, expectations cannot stay out of line with fundamental supply and demand conditions for very long. Commodity prices affect demand conditions for land, causing rapid land price acceleration by lifting land price expectations. Returns on alternative assets can also make purchasing land more attractive. Land prices rising faster than the rate of inflation motivates land purchases. If the growth rate of land prices is higher than the return offered by other assets, such as bonds, potential investors have an even greater incentive to purchase land. 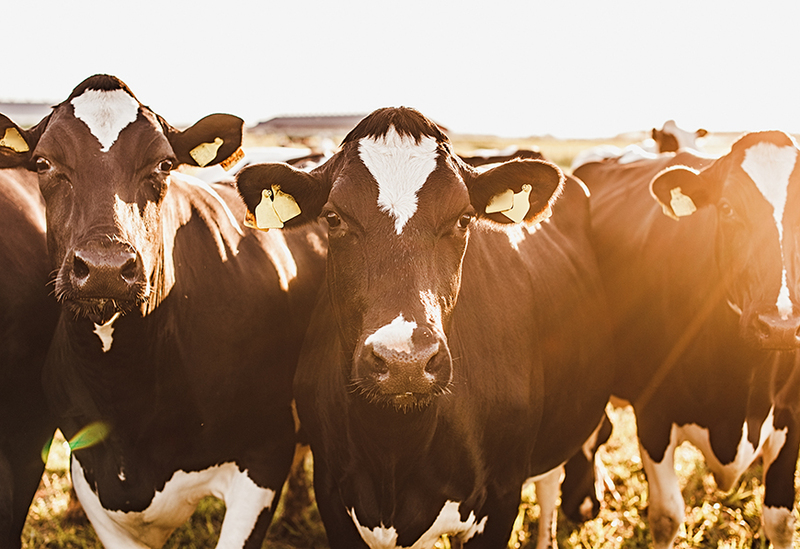 A rational land investor, other things equal, will not pay more for an acre than the amount required to purchase an alternative investment that provides an equivalent return. For a given interest rate, the price of land changes whenever the expected real net returns on owning the land change. The expected net returns change when expected revenue or expected costs change. Such an increase could follow from changes in commodity prices that affect land prices by raising the expected net income associated with land used to produce that commodity. If investors in land believe in prospects for earnings growth, they are willing to increase their bid prices for land coming into the market. They may even attempt to sell other assets to take advantage of the higher-yielding investment opportunity from purchasing land. Land values would then increase until the expected return on land has fallen to a level comparable with returns on alternative investments. When land values increase more than expected, current landowners' wealth grows. Landowners who bought at lower prices realize a higher rate of return on their initial investment, incentivizing them to acquire more land even if it means doing so by debt financing. Currently land price growth is greater than the return on a ten-year Treasury bill (Figure 6). From 1Q2010 to 2Q2016 in real terms, land prices have risen on average by 2.8 percent compared with a 0.1 percent return on the ten-year Treasury. The differential on average between both for the same period is around 2.7 percent (Figure 7), making land purchases more attractive than other assets similar to Treasury bills. Still, the growth rate of land prices declined in the aftermath of the commodity downturn at the end of 2014 and the Texas economy's slowdown. Land price volatility fell by 12.7 percent from 1Q2010 through 2Q2016 compared with 1Q2000 through 4Q2009 measured by the standard deviation in price growth in each period. 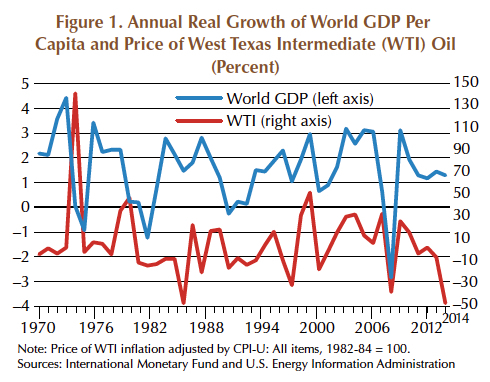 Interestingly, the price volatility of oil also declined during the same period compared with the other commodities discussed, possibly exhibiting a relationship between oil prices and Texas land prices. The next step in the Center's research is to measure the relationship between real prices in oil, cotton, beef, corn, and land to first find causality between them and land prices, and then to see if a short-run and/or long-run relationship exists. These results will be presented for the state and its seven land regions. This could prove most interesting because land use in each region is different, and the effects of each commodity would be expected to be different. Dr. Torres (ltorres@mays.tamu.edu) and Dr. Gilliland (c-gilliland@tamu.edu) are research economists with the Real Estate Center at Texas A&M University.